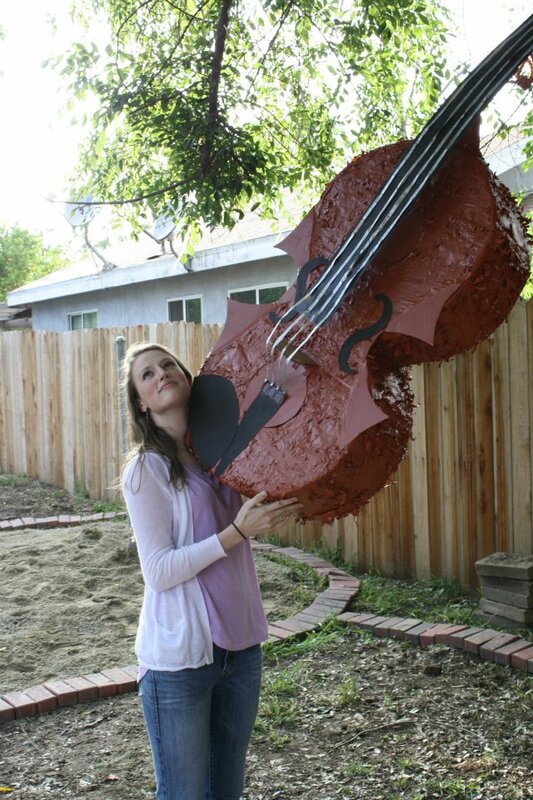 You may ask yourself- when the heck does Danielle have time to make a violin pinata? Well, I don’t have time. But for some reason, it became a PRIORITY. I suppose there was a reason; Ryan and I hosted a party at our house for Mr. Lipsett’s students 21+ and I had this idea that we needed a pinata. Maybe it’s my “latin blood” kicking in, or maybe I just need to have a hobby outside of playing/teaching violin. 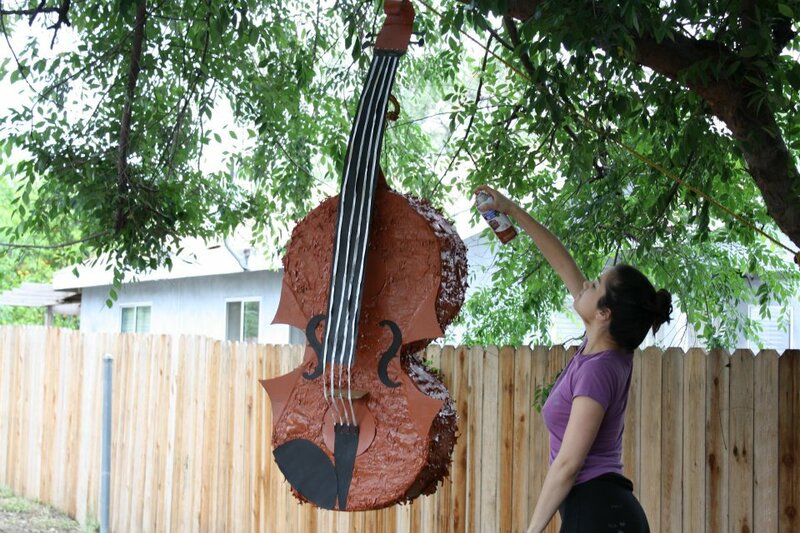 Funny that even though this newly embraced hobby of making a Pinata is about as far away from my profession, it somehow still embraces the Violin as its muse. As I spray paint my carefully crafted giant “violin strings” with silver metallic beauty, I wonder, am I in the wrong business? Ever since I was a little girl, I’ve always loved crafty projects, as long as they were wildly fabulous. A few of my favorites – a fully realized Mermaid costume complete with shell top, sequined tail and companion Sebastian the crab costume made of red felt (claws were tricky, but that trusty glue gun always wins!) A Sushi costume detailed down to the grains of rice and seaweed belt, a Tinman costume for my husband, etc, etc. 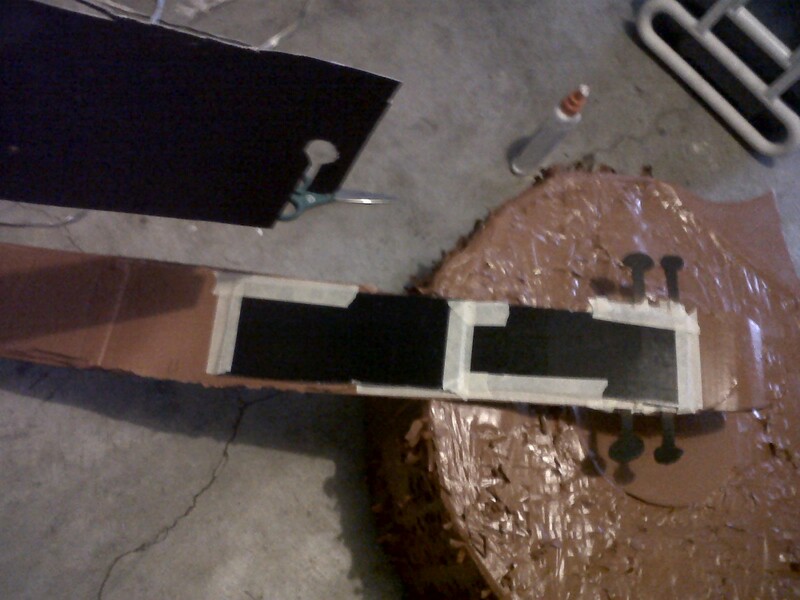 Anyway, back to the Violin Pinata. No special artistic gifts are required to make this pinata, just pure determination and a little bit of craziness. 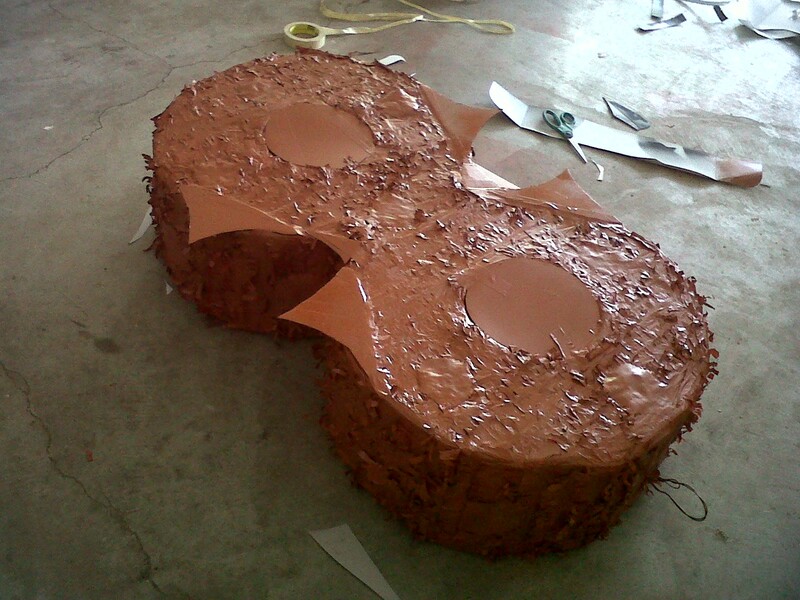 Step 1: Buy a Pre-made Pinata For The Core “Body”. I should first say that I searched everywhere online for a violin pinata, then I drove by all the party stores in Downtown LA to see if they had anything resembling a violin, even a guitar, and found nothing. I thought about “custom ordering” one from this famous pinata store, but that would have cost around $100. Then I thought about making it totally from scratch myself, but quickly scratched (pun intended) that idea as it would be quite time consuming and ambitious, even for me. Finally, I had a brilliant idea! 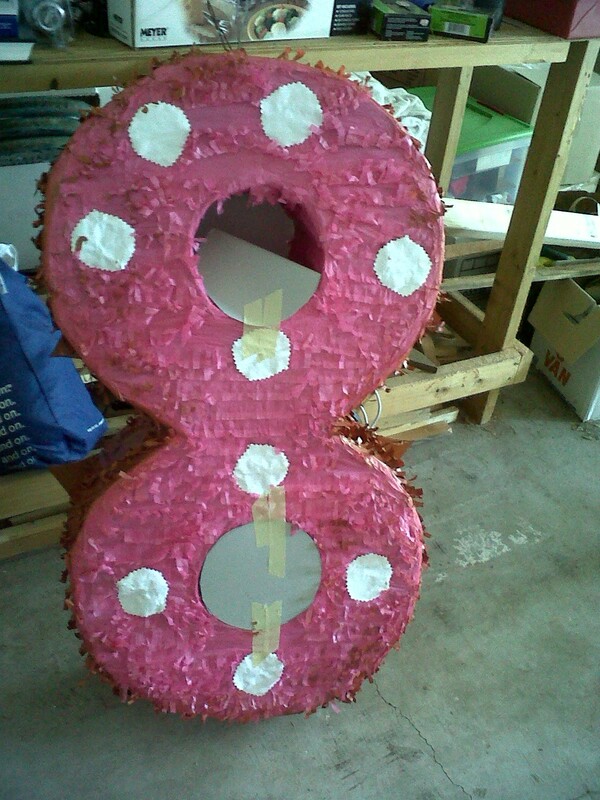 They have pinatas in the shape of giant numbers for kids’ birthdays and the number “8? has a body shape similar to a violin!!!!! This one cost $13 at a party store downtown and is very well crafted. 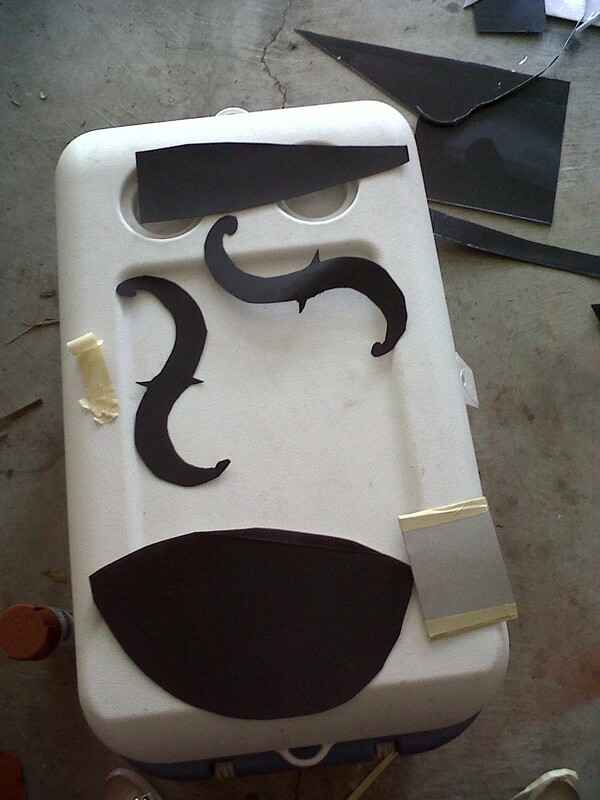 Also, cut out 4 shapes for pointed ”wings” that will give more of a violin shape to our very rounded “8? shaped pinata body. 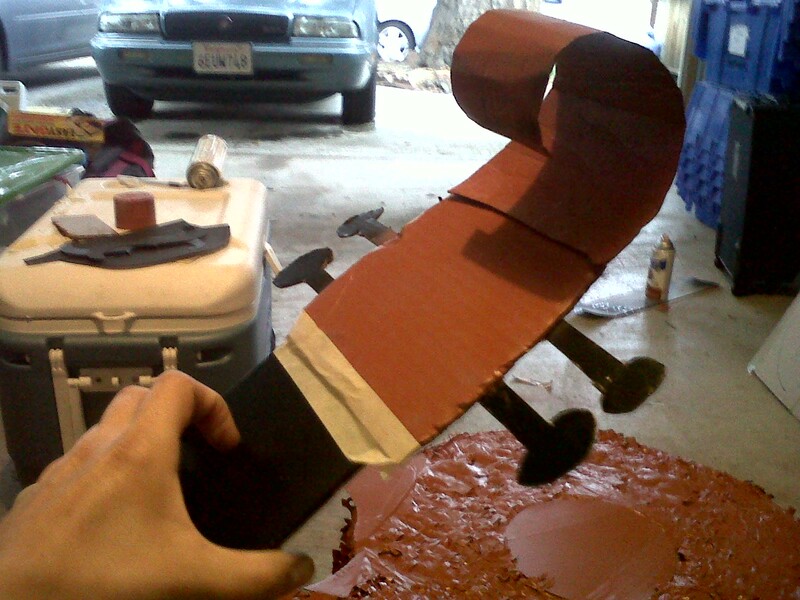 These wings will need to be affixed now as it will be part of the violin’s body to be spray painted “Cinnamon”. (see to the right and below for “wings”) Don’t worry if the violin at this point still looks a little crude. Once you add the accessories, no one will notice or even care. Don’t do this indoors, duh. Make sure you are in a well ventilated space. 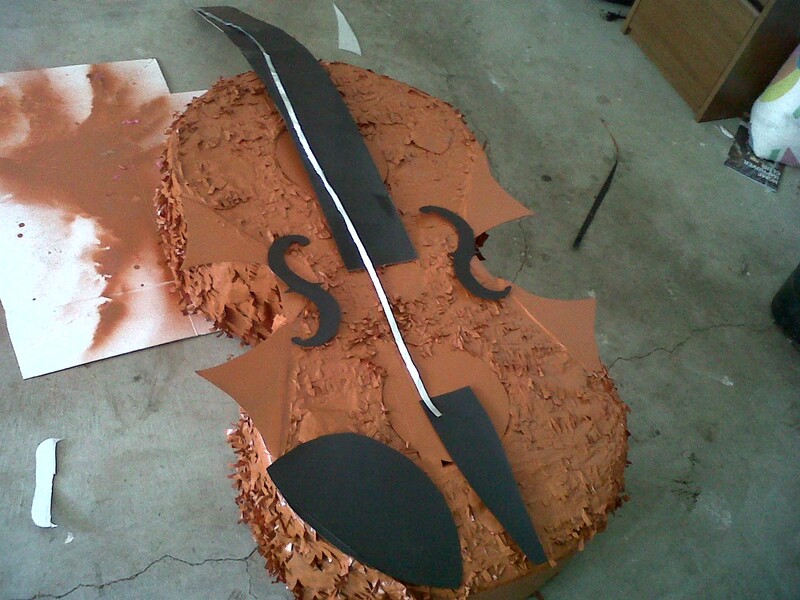 Spray the entire facade and sides of your violin body with the “Cinnamon” or whatever woodish color you chose. Don’t forget those hard to reach spots under the wings you just taped on! 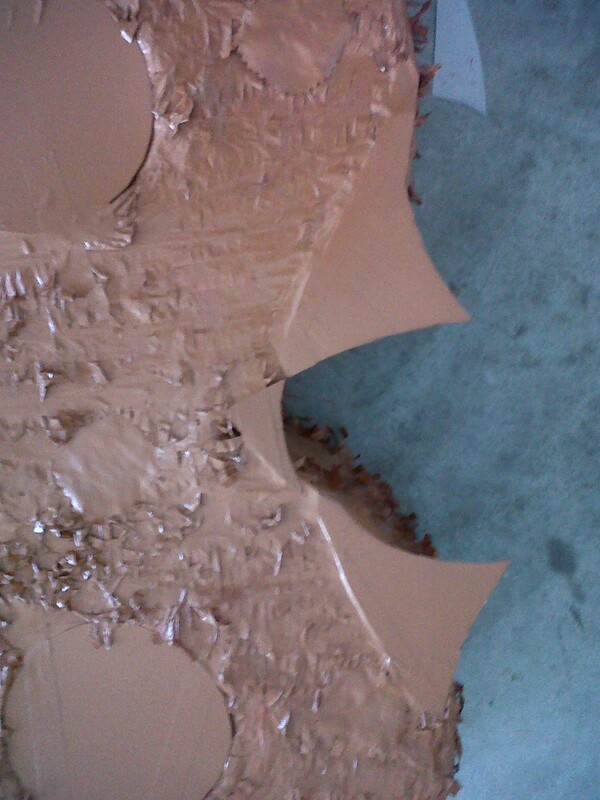 After this coat is dry, flip over and spray paint other side and all the nooks and crannies! Cut out a strip, or 2 as I did, the same width as your fingerboard and “curl” the top by creasing the cardboard and bending it into something resembling a scroll. The pegs should be black and can just be glued or taped on from behind and then you can fli p over and spray paint over the tape or anything messy to match and look nice. (Cover pegs when spraying “cinnamon” color so as to keep them black) Attach the scroll and pegbox to the top of the fingerboard. Ok, I’m pretty impressed with myself on this one. 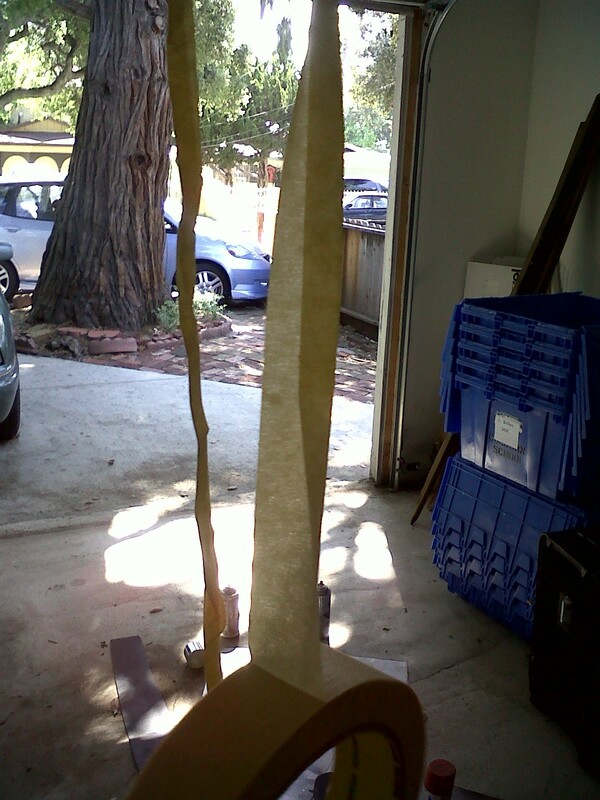 The neck is very long and thin and somewhat flimsy when made out of just a strip of cardboard. I was trying to figure out how to make strings that would look decent on a giant violin pinata. I couldn’t just use rope or something because it wouldn’t match all the other paper-based materials that we’ve used so far and it would be the only thing to survive a good beating. No, I needed something that could be ripped apart like the rest of the pinata, but sturdy enough to hold their place. 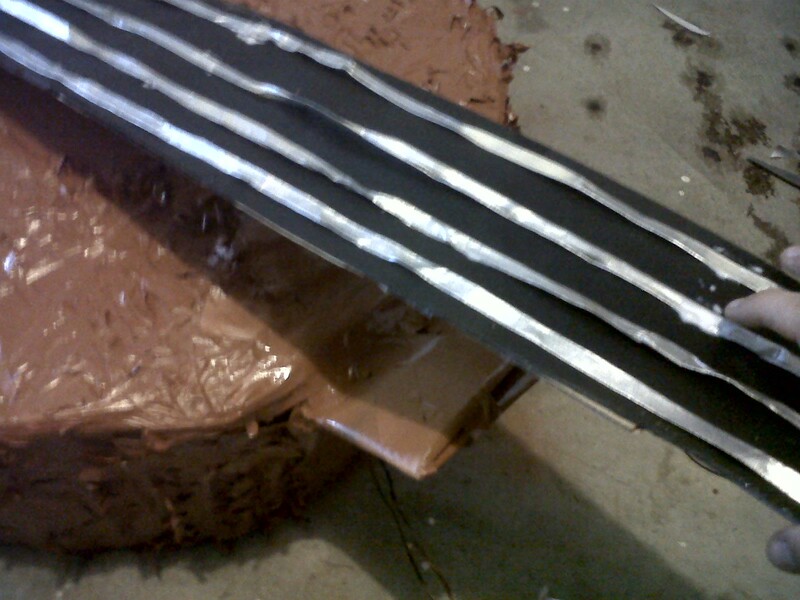 Masking tape works perfectly and can easily be manipulated and spray painted silver. See picture to the left for string making process. I folded over the tape in half and then in half again, trying to kind of round out the shape. 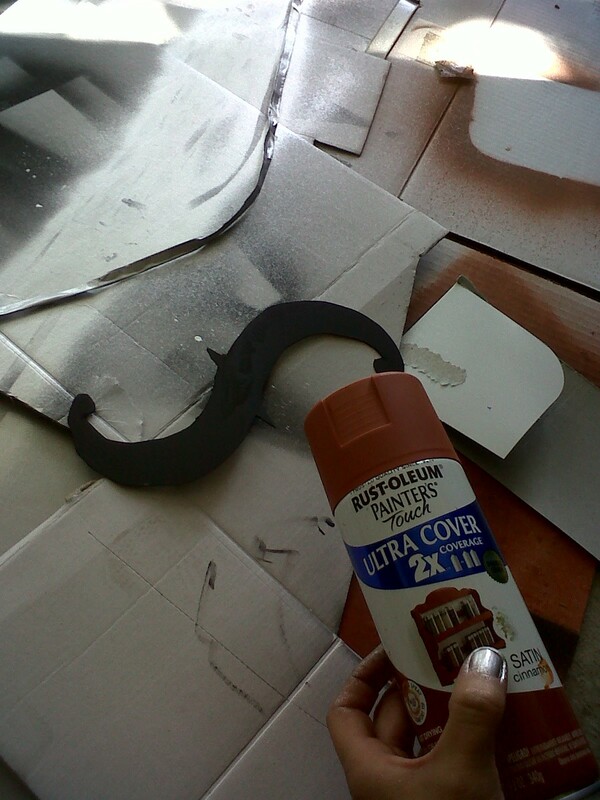 Once it’s spray painted silver, it looks amazing, so don’t worry about any imperfections. You’ll need 4 of these strings and they should each measure from the tail piece all the way to the top of the neck where the scroll will go. Just approximate on the longer side and you can always rip it to make the string shorter if necessary. This is the most fun part because now it starts to actually look like a violin. See picture below for the layout of the f holes, chinrest, tailpiece and neck. If you are a violinist yourself, you don’t need my help for this part. Just eyeball it! Notice that the neck looks flimsy in this picture. As mentioned before, I solved that by adding a little cardboard reinforcement behind it shown in the picture above. Almost ready to fill with candy…… You’ll need to cut a small hole in the back to fill with all kinds of goodies. In this case, I bought lots of different goodies that I thought college violin majors would enjoy; Sour Patch Kids, Pencils, Soap, Top Ramen packets, and even some Wet Wipes. Final Step : Party Time!! Hang from a tree with a sturdy rope, blindfold your guest, hand them a bat and go to town! Pictures below are from the actual party – everyone had a blast.